We hate when that happens, too! 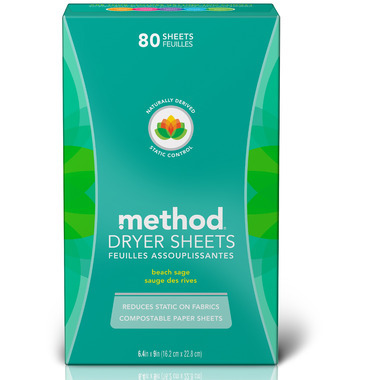 take control with method's new dryer sheets. Made from 100% compostable paper, these planet-friendly dryer sheets reduce static and soften your fabrics. Plus, they make clothes smell delightful. Double win! Beach Sage Fragrance: like a morning stroll along a misty beach. Sand not included. All method products are vegan and cruelty-free. For people who are sensitive to smells...DO NOT BUY THESE. These are over the top fragrant. Couldnâ€™t even open the plastic bag they came wrapped in. Knocked me off my feet. Why do all these companies have to make everything so scented? Not healthy for us. I got a refund on these. I wanted to like these so bad but they smelled way too strong and it was almost like they generated MORE static in our clothes. Terrible product which is strange because I like most of their other products. They really need to go bAck to the drawing board on this one! If you have any sensitivities or allergies to fragrances, do not buy this product. The scent is overpowering and gave me a headache and a runny nose immediately. I find the performance of these sheets to be on par with more expensive brands and I love that these are better for the environment! I do find the scent extremely strong from the box however when used it is rather light on clothes. I usually love all method products! I can not say the same for these. It is nothing wrong with the product it's self. The scent is very strong and actually makes me nauseous! Maybe willing to try a different scent but not this one. Really strong fragrance. Not for people who are sensitive to fragrance. They work fairly well. The scent drove me crazy from the time i unpacked the shipping box. Could smell it all over house and got instant headache. Gave them away. Too perfumy. Not for me. Tried Sage scent. Even though it Smells strong in the box, it doesnâ€™t leave a strong smell in clothes. Does it work better? Definitely compareable to others in performance but bonus for environment. Will buy again, maybe Try the other scent. The texture is different than typical dryer sheets but they work great and I love the scent! These smell great and work well to reduce static. I do find my clothes come out softer than when I use dyerballs. Would definitely buy these again. Love that they can be put in my green bin instead of the garbage. i wasnâ€™t expecting them to be so rough. But they do smell good. They really do work for static cling. Especially for my wool sweater that regular bounce sheets seemed to not work as well. I don't get what all the complaints about the smell are about. These smell great and work great for static, but I'm disappointed about the minimal scent transfer to clothes. Smells great, would definitely purchase again. This is one of my favourite dryer sheets!! Just love the fragrance! The sheets might smell a little strong before you put them into the dryer but the scent on the clothes is nice and light! I'm so happy with these dryer sheets! No animal fat. All natural ingredients, and the scent is wonderful. Some reviews said the scent was overwhelmingly strong but I totally disagree. I also bought the Ginger Mango sheets and that scent is wonderful - and not too strong at all. I'll be buying Method dryer sheets as long as they're on the market. One per dryer load and NO static. Love it!!!! I love the light scent plus the fact that you can rip them in half for smaller loads. I was skeptical about using these at first because they are stiffer than regular dryer sheets so I used them on my husband's work clothes first. ;) They worked really well and the scent was great. My husband even liked the scent. I'll continue to use this product. Amazing fresh smell! Love the Method line. It's a staple in our home for all cleaning products. The smell is overpowering and too masculine! I could smell it in the postal box and was wondering if something had spilled. Did not use them, it just smells too strong. Wish I could return or exchange. The smell of these things was absolutely horrible and insanely strong. I didn't even take them out of the plastic bag that well.ca packed them in and I still couldn't keep them in the house. I briefly considered taking them to the office to see if anyone would use them but couldn't stomach thought of a 1/2 hour drive with them in my minivan. I see they offer a different scent but I'm afraid to try it. They seem to work well, but as others have mentioned the smell is overwhelming. Not so much on the clothes after being dried, but it kind of punches you in the face when you walk into the laundry room. I love Method products, but this scent is way too strong. Scent a little too strong but love everything else about these. Would buy in another scent next time. The scent is so overpoweringly strong. It made everything that came in my order stink. I do agree that the scent is milder once put in the dryer but until then it is way to strong. This is a great product. Softens without that strong, chemically fake scent. Definitely recommend. I love all Method products and decided to try these dryer sheets. I could not believe how soft and lovely my towels are! Scent is fresh and lovely! I found that it does not last long, which is fine, the softness does last. I did not know about tearing them in half so perhaps I used too much. Will know for next time. Wil buy again. I really like these dryer sheets. Although it can smell a little strong in the box, it doesn't give your laundry an overwhelming scent. Being compostable makes it all the better! Natural /organic or not I couldn't relate to the ingrediants for beach sage liked the scent just too much. I love the smell of these dryer sheets, however my clothes do not smell when after using them. They do reduce static. Great scent and works really well for static cling! Yummy scent, last a very long time (we use one half sheet for 2 or 3 loads). My only complaint is that the sheets are supposed to be torn in half and have a perforated line, but they always tear unevenly (off the line). Annoying. Other than that, great, love them. This is the second time I have bought these dryer sheets. I love them! I haven't used fabric softner of any kind in years, but with 2 dog and 2 cats the pet hair on our clean cloths was getting out of control. I found these and gave them a try. They work great! I usually only use a half sheet even for large loads and there is practically no smell when the close are done, which I like. I can't handle strong scents so I was really worried about these being too strong once the c,othe were dry, but they aren't. However, when you get the box and open it, the smell is very strong. I have to store the box in a zipped plastic bag to keep the strong smell contained, otherwise we will all be sneezing. I was so happy so see that method started offering dryer sheets again that I jumped on 2 boxes during the last sale. I was a huge fan of the old sheets in unscented, and not knowing what "beach sage" would be like, I went with what the reviewers were saying. If you're the same way, you will want to store the dryer sheets in a zipper bag; the boxes were tucked away in a cabinet but managed to make the whole floor of my house smell like super-strong beach sage. So I'm taking one star off for that. Otherwise, super glad that method's making dryer sheets again, but I'd be happier if they also made an unscented version. Smell is really subtle on the clothes. Great job at removing static! An interesting product that uses stiff paper sheets. I found that the scent doesn't linger, but it does the job of softening and reducing static cling. Smells really nice and works great at removing static. Clothes don't have a strong smell but they are very clean and free of chemicals that make scents last long. Its also one of a few products I can wash my kids clothes in because they are very allergic to phosphates found in other detergents and fabric softeners. We haven't had any reactions to this product or the detergent! We normally use the dryer balls, but ours don't always do the trick to remove static. For sheets and towels we add one of these sheets and they work nicely. Love these dryer sheets. It removes static wonderfully and leaves your clothes with a light scent. Works great as a freshener in a linen cupboard or mud room where there are smelly shoes. This is a pretty good product. Works great on static and is environmentally friendly. The only downfall is that it seems to not leave a fragrance behind. I love a nice and strong fresh laundry smell, and with these dryer sheets I would have to bury my face in the clothes just to smell something faint. I am not sure if I will buy this product again but works great on static! I was so excited to learn that Method came out with dryer sheets and in one of my favourite scents (Beach Sage). I'm sure the texture of the dryer sheet (more like wax paper than the cotton feel of a bounce sheet, which I am not even sure I can recycle where I live) is just a matter of getting used to. However I find it leaves my laundry with no scent at all. Just using the method detergent with no dryer sheet, my laundry had the smell of the detergent. But now my laundry comes out with no smell at all. It does remove static, but I like the smell of fresh cleaned laundry and this does not happen.